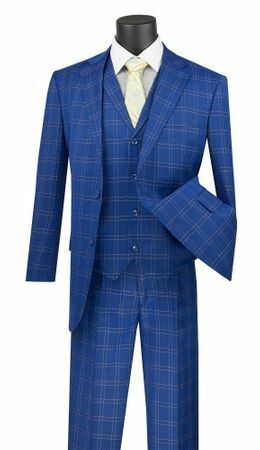 Go to town in style wearing this royal blue plaid 3 piece suit that has a 1920s lapel vest that looks great by itself. This suit comes in a regular fit for the grown man. The pants on this royal blue plaid 3 piece suit are single pleat front and unfinished for hemming. All made of fine super 150s poly/rayon.